How about a little break from the Desmond Pack sew-along? Here is a preview of my second post for The Sewing Party! 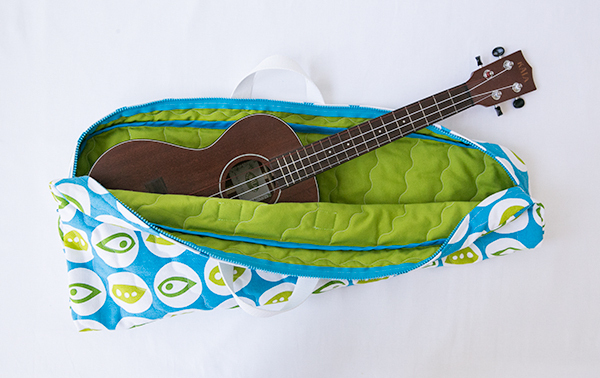 I made a quilted ukulele bag with some fabric I, eh, “borrowed” from by wife’s fabric stash. I think she was going to make pillow cases or something at one point, but never got around to it. Since she doesn’t really sew any more, I’ve slowly started to claim her fabric stash as my own. 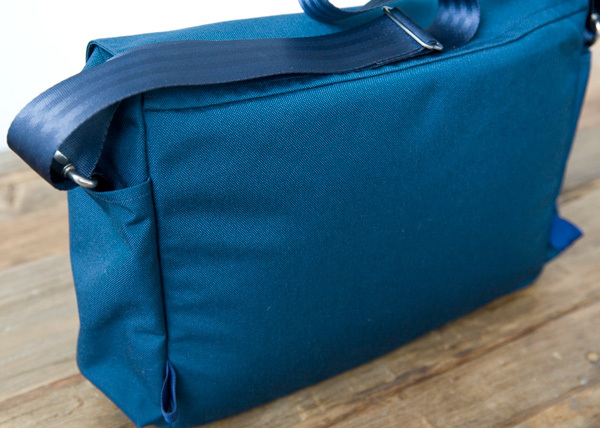 Over on The Sewing Party’s website there is a full tutorial on how to make your own custom sized instrument bag. There are directions for making the pattern, which is actually pretty easy with only two pattern pieces to make based off of your instrument. 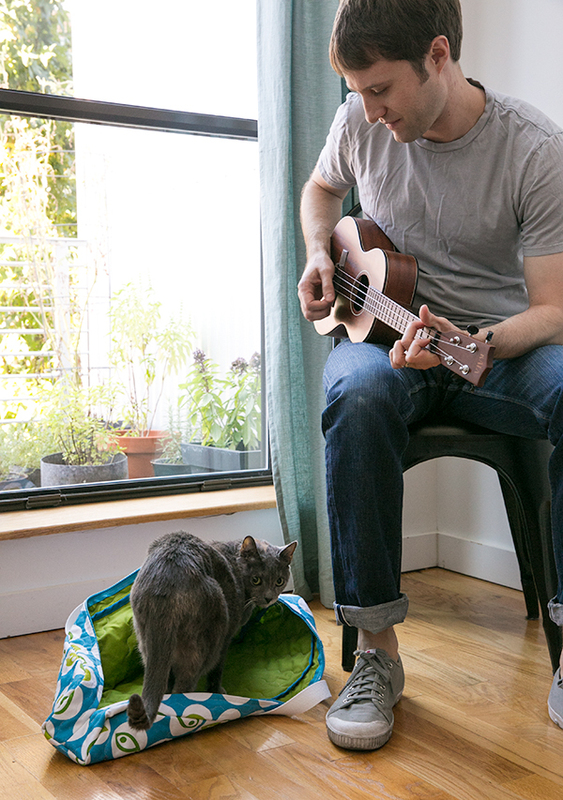 The pattern can be adapted to fit any small instrument, not just ukulele’s. Go check it out! I am contributing to The Sewing Party’s blog this year and I am thrilled to be part of the program. There are lots of other fun and interesting articles from the other contributors, as well as contests, including one right now where they are giving away a sewing machine and a bundle of McCall’s patterns! Details about the contest are here. Even if you don’t have a small instrument, you should probably make one of these anyway. Apparently they make great small animal beds too! Head over to The Sewing Party for the full set of instructions and lots more step by step images. I hope everyone had a great weekend! This is the third step in my Desmond Backpack sew along. Picking up where we left off last week, we are going to continue construction on the exterior of the pack and make the front zipper pocket. If you need to look back at the previous two steps, you can see them here: Step 1, Step 2. The pattern is available in my Supply Shop for anyone who wants to join in the fun. Let’s get sewing! Cut two pieces of webbing 4″ long. If using synthetic webbing (nylon, polypropylene, etc. 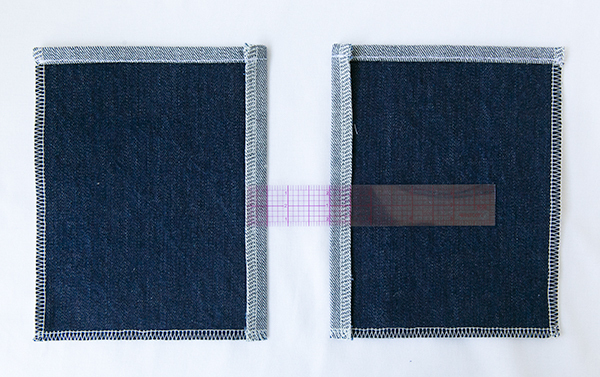 ), melt each cut end of webbing to prevent fraying. Don’t worry if you are using natural fiber webbing. The frayed edges will not be visible on the outside of the pack. You could always run a line of stitching (using a short stitch length) very close to the ends of your webbing as a safety stitch to keep the webbing from unraveling further. Do this before sewing the steps in this post. The ends of the webbing will be concealed under the zipper pocket. 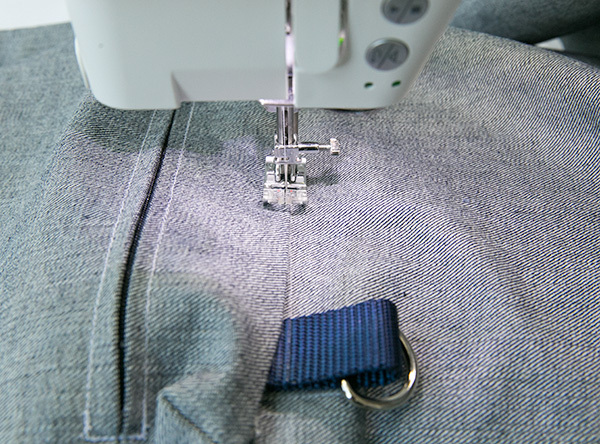 Finish all edges of pocket pieces C and D with an overlock or zig-zag stitch. With right sides together, sew top of piece C to bottom of piece D using 3/4″ seam allowance with the following stitch length adjustments: From the edge of the fabric to the first zipper end mark, sew with normal (around 2.5) stitch length and backtack where indicated in the pattern directions. 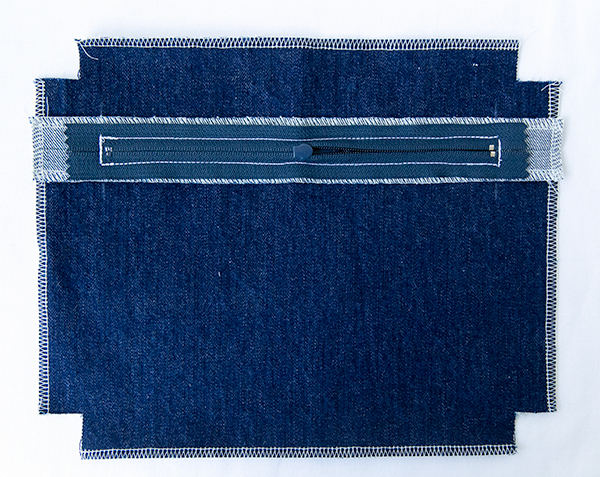 Between zipper end marks sew with long basting stitches (above 4). From the last zipper end mark to the other side of the fabric, sew again with normal stitches, backtack/back stitch at zipper end mark. Press seam open. Center zipper between zipper end marks aligning zipper stops with end marks, right side down, on top of seam. 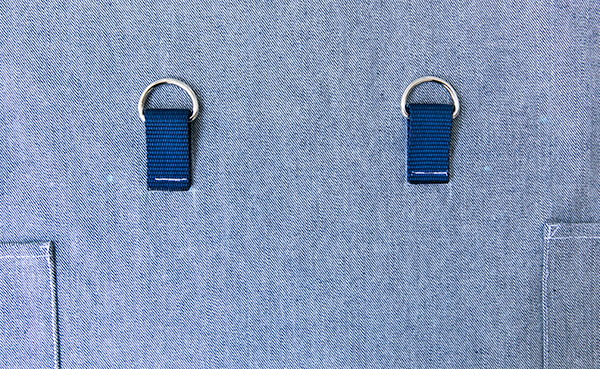 The zipper pull can be oriented in either direction depending on personal preference. Pin in place. I actually used little clips to hold my zipper in place. Sometimes pins can distort the zipper tape too much. Stitch zipper tape in place 1/4″ from center of zipper teeth on each side of zipper. Stitch from one zipper stop to the other zipper stop, leaving ends of zipper tape free. Turn pocket to right side. 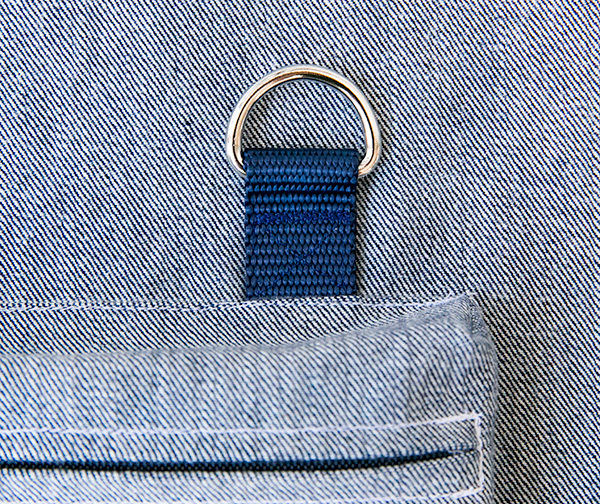 Feel through the layers to locate the zipper stops, and using chalk or fabric safe marking pen, mark across zipper stops on right side of pocket pieces C and D. Sew 5 lines of close straight stitching (like a back tack) (or use a bar tack) through the right sides of pieces C and D, catching the seam allowance and zipper tape below. Start and stop stitching at stitch lines created when attaching the zipper. Be careful not to hit the zipper stops. Here is what the backside should look like. 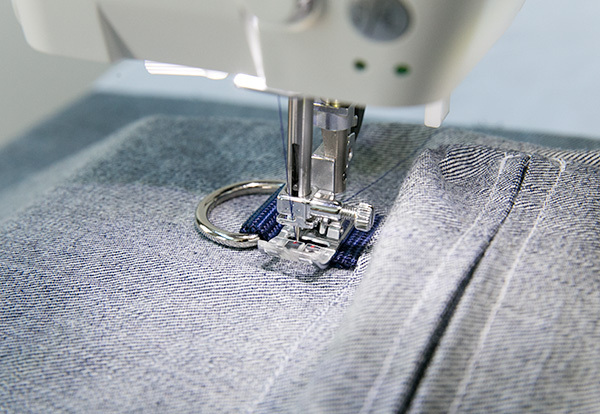 Remove basting stitches between zipper end marks. Turn pocket to the wrong side. Fold each corner cutout so right sides are together, and sew each corner using 1/2″ seam allowance, stopping 1/2″ from the bottom. 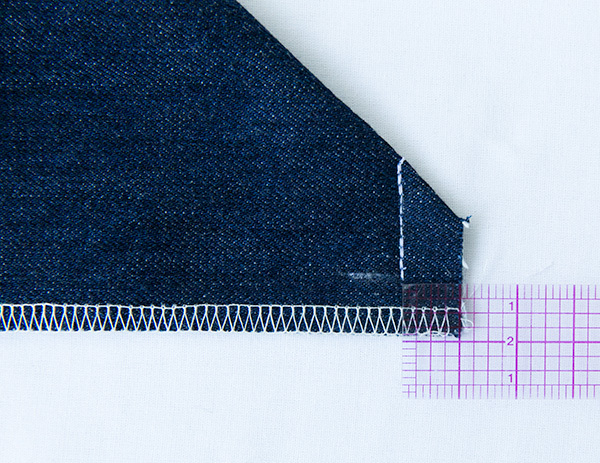 Using a ruler as a guide, press under 1/2″ seam allowance all the way around the pocket to the wrong side. 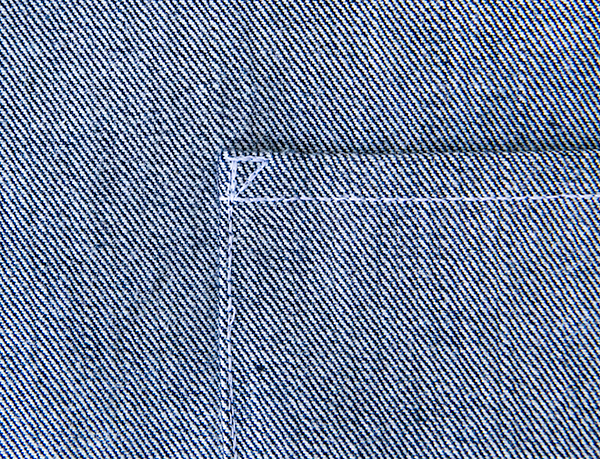 Press open corner seam allowance as much as possible, distributing evenly on either side of the seam. A close up of what the corner looks like. Tip: if working with extra thick fabric, trim extra bulk out of corners if it helps with positioning and attaching the pocket. Place front zipper pocket within placement markings on right side of exterior piece A. Pin in place if necesary. Starting along top edge, edge-stitch top edge of pocket in place from one corner to the other. Do the same for the right and left sides of the pocket. This will help keep the pocket square and in place. Tip: If working with extra thick fabric, rather than sewing from corner to corner, start sewing from the middle out to the corners. Sometimes it is easier for a presser foot to sew into a thick area, rather than start on top of one. Tuck corner seam allowance inside as you sew. Then edge-stitch the bottom of the pocket using placement lines as a guide. Add a second row of stitches on top of the first row all the way around the pocket for reinforcement. With D-Ring pushed to the top of webbing loop, sew 5 rows of close straight stitches through both layers of webbing and exterior piece A across bottom of D-Ring. Start stitching on the right side of the D-Ring, and stop with the needle down on the left side of the D-Ring after the 5th row of stitching. (Moving the needle, or using a narrow presser foot might be helpful for this step to get closer to the D-Ring). With needle down, and referring to (Figure 9) in the pattern directions, pivot at #1 and sew to #2. Follow the numbers in (Figure 9) to sew an X-pattern, stopping at each number with the needle down, and pivoting to sew towards the next number. The stitches are hard to see with my matching thread color, but hopefully you get the idea. Repeat for other D-Ring. Here is what the front zipper pocket should look like at this point. Now the front (and sides) of the exterior of the pack are complete. You can set this aside for now. Thursday we will start work on the back of the exterior of the pack, which includes all of the straps. Feel free to get in touch if you have any questions about the pattern or sew along. The sewing begins! 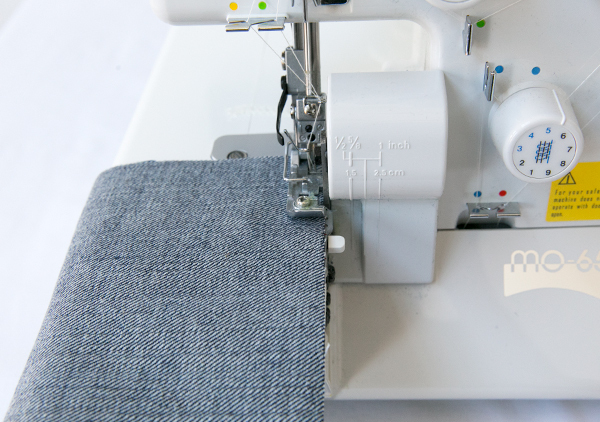 If you haven’t already, you might want to look over Step 1, which dealt with assembling your pattern, choosing fabric and hardware, cutting out your fabric, and marking all of the placement and construction lines. Also, if you are sewing along and use Instagram, I’m using the hashtag #thedesmondpack for some of my construction images. Feel free to tag your pics as you make your packs. I would love to see what you come up with! 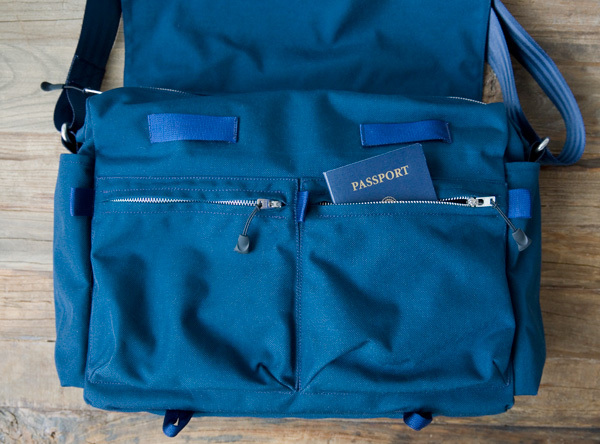 Today we will be starting construction on the exterior of the pack, specifically the side pockets. 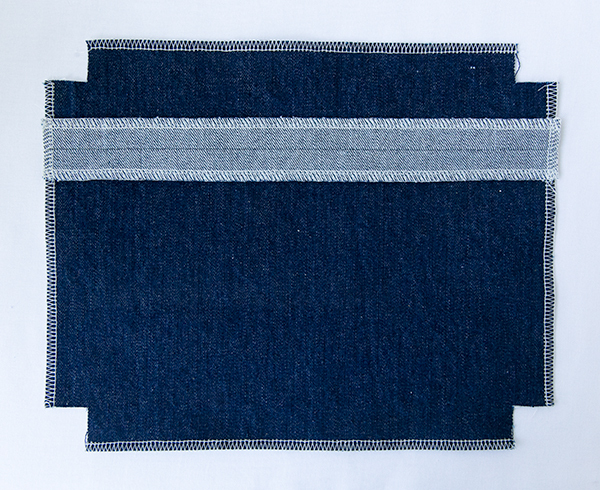 Throughout the sew along, I am using the “wrong” or reverse side of my denim as the “right” side. Just a reminder so there isn’t any confusion as to why I’m not using the typical dark side of the denim as my right side. Seam allowances throughout the pattern are 1/2” unless otherwise noted. The pockets use both 1/2” and 3/4” seam allowances, and the pattern pieces are marked to show where to use a 3/4” allowance. 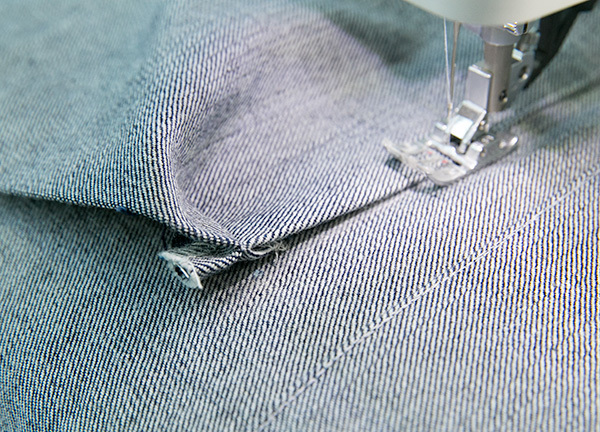 Other than a couple of places, it really isn’t necessary to trim seam allowances like you might when making a garment. For the most part, the extra seam allowance will add a little structure to the seams, which is nice for a pack like this one. 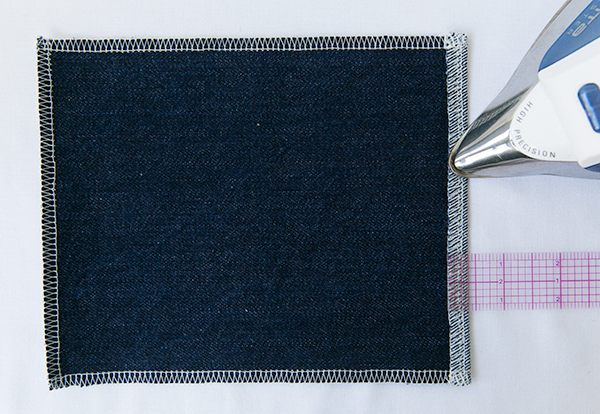 Any place I mention edge-stitching, I’m stitching 1/16″ from the edge of the fabric. 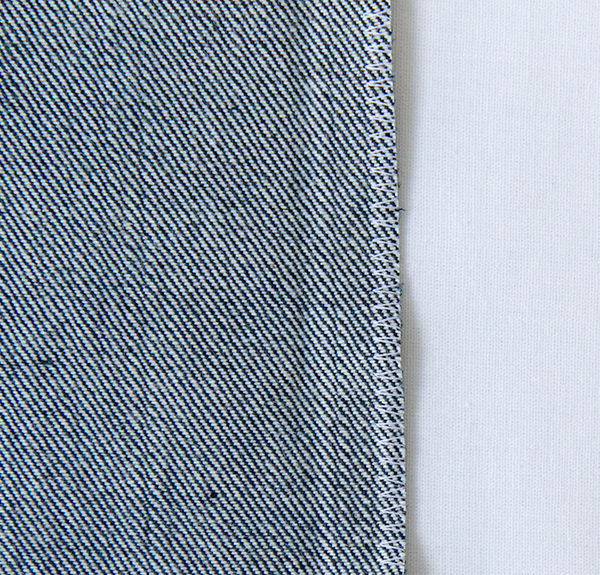 If you don’t like getting that close, 1/8″ from the edge of the fabric will work. 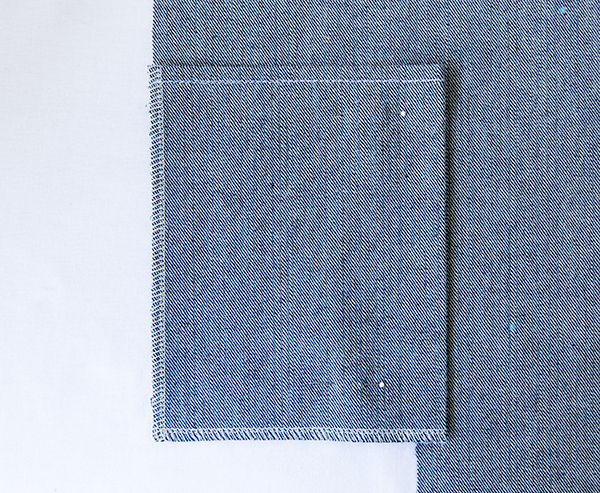 Start by finishing all edges of exterior pocket pieces E with an overlock or zig-zag stitch. 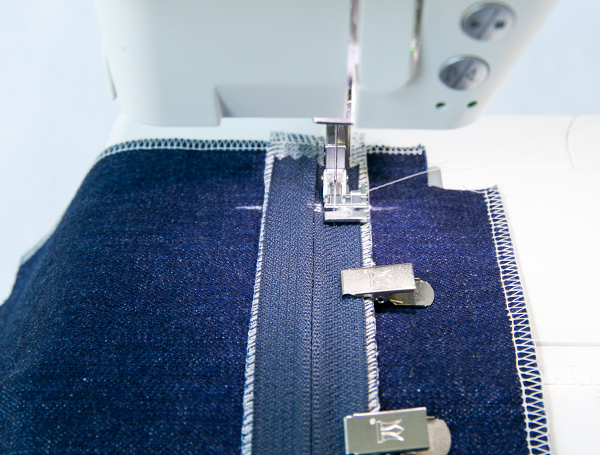 I’m using a serger on mine, but a tight zig-zag stitch will work just as well. These edges will be tucked inside the pockets anyway, but I like to have them finished so they don’t fray as you take objects in and out of the pockets. Alternative zig-zag stitch along edges of pocket pieces E.
Finished edges of both pockets. 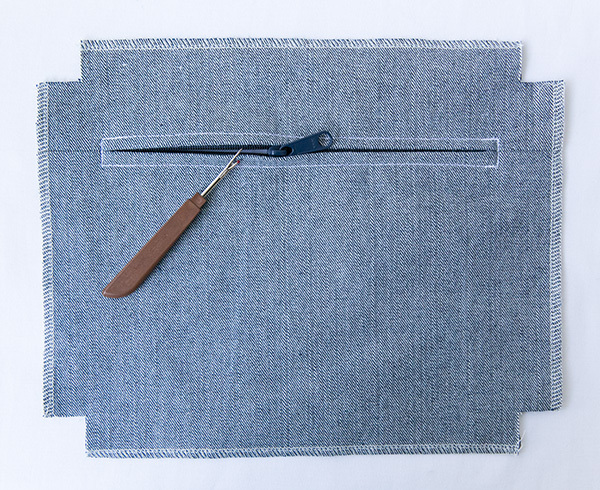 Fold over 3/8″ at the top of each pocket piece E to the wrong side of fabric and press flat. Repeat, folding over and pressing another 3/8″ to the wrong side. Once you have a nice flat edge, top-stitch the folded layers down from the right side 1/4″ from folded edge at top of pocket. 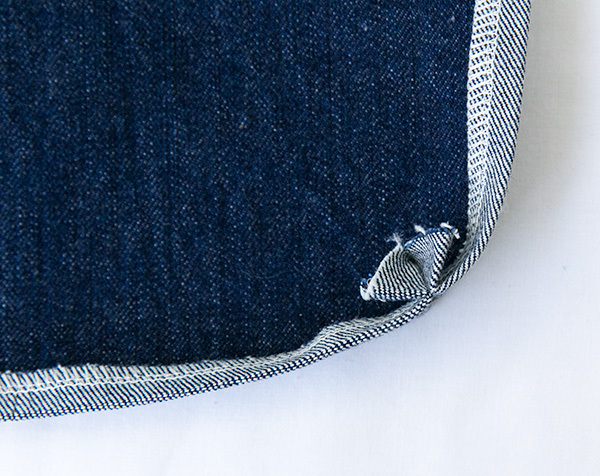 Next, fold under 1/2″ seam allowance on the left side of one pocket piece, and 1/2″ seam allowance on the right side of the other pocket piece. Press flat to wrong side. Don’t worry about the bottom edge and other sides of the pockets. These edges will be concealed inside the pack later. Turn pocket pieces E right sides facing up. Align pocket pieces E within exterior side pocket placement lines and pin in place to right side of exterior piece A. 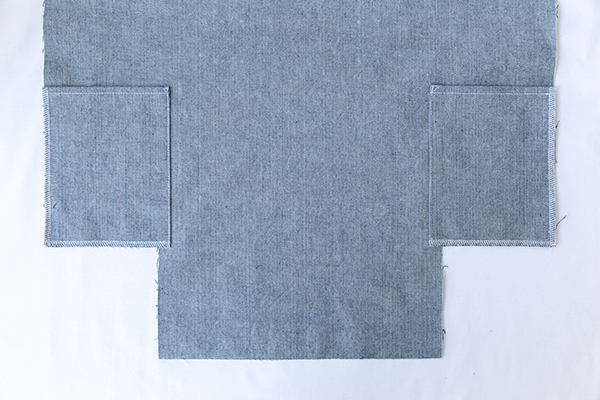 The pressed under side edges of the pockets should be facing the interior of piece A.
Edge-stitch pocket pieces E in place along the pressed under side of each pocket. Add a second row of stitches on top of first row for reinforcement. Then reinforce the top corner of each pocket as shown above. Lastly, baste the bottom and opposite side edges to exterior piece A 1/4″ from raw edges. Here is what the finished side pockets should look like at this point. That’s it for this step! 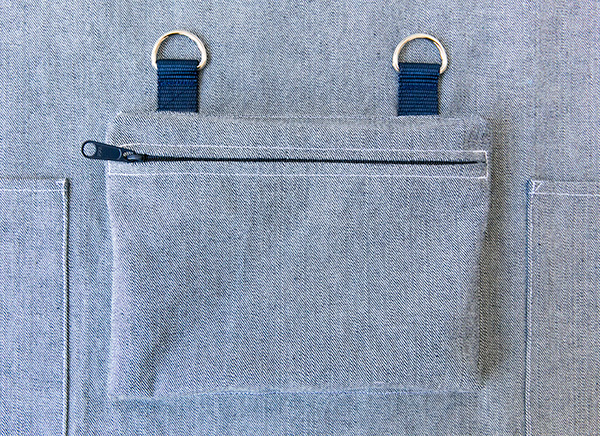 We are starting out slow, but will be taking on the front zipper pocket on Monday. 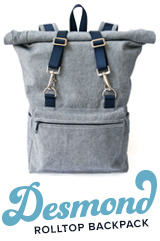 Welcome to the first step of the Desmond Roll Top Backpack sew along! We won’t be doing any actual sewing until Thursday, but there are some initial things to take care of before we begin. First up, make sure you have your pattern! :). The pattern is available in my Supply Shop. For help with printing and assembling the pdf pattern at home, I have a guide to assist with that process. 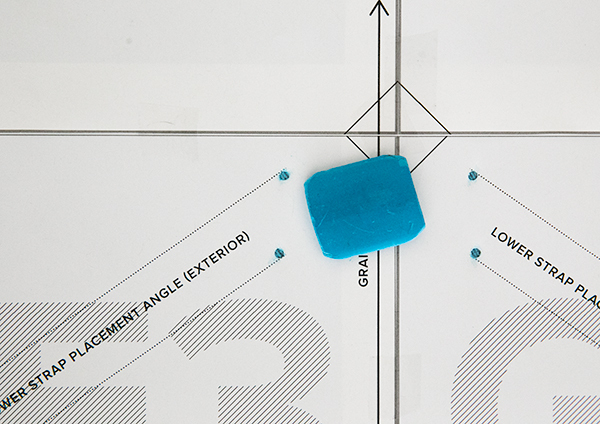 Once you have your pattern, the next step is to decide on fabric and hardware. 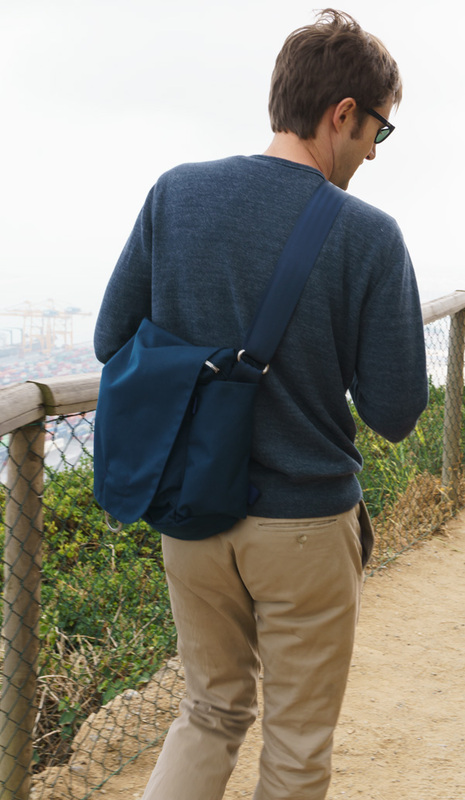 The pattern calls for 1 yard at 60″ wide of exterior fabric (the outside of the backpack). I recommend using a medium to heavy weight woven fabric, a 10oz cotton canvas for example, or a bottom weight woven. Lighter weight fabrics should be interfaced with medium weight fusible interfacing. If you want to use something lightweight without interfacing, a nylon Cordura would work nicely. Cordura can be light but still very strong and durable. The lining requires 1 yard at 45″ wide. 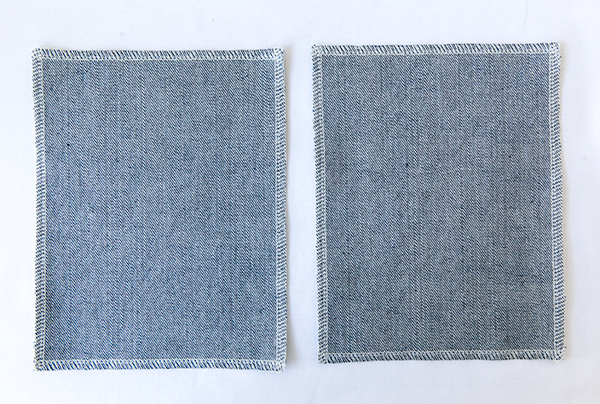 I recommend using a medium weight woven fabric like 7 0z – 10 oz cotton canvas, or a bottom weight woven. Again, lighter weight fabrics can be used, but they should be interfaced with light to medium weight fusible interfacing. 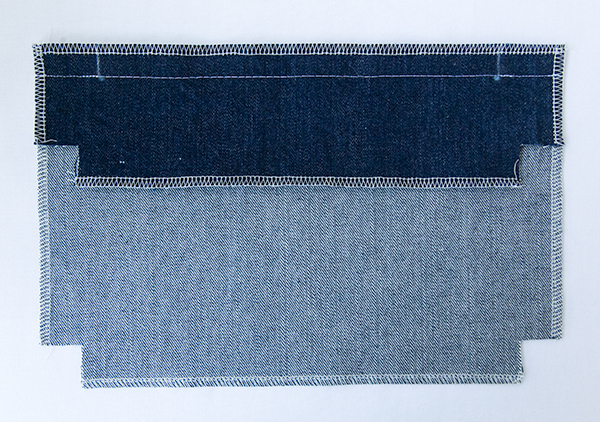 For the sew along, I am using the reverse side of denim for my exterior, and some natural canvas for the lining. One of the things I love about making bags and backpacks is that there are lots of options for fabric. Heavier apparel fabrics will work, as will home decorating and outdoor options. The sky is the limit! I am washing my denim and canvas (separately) several times before I start sewing. The denim has a lot of starch, and I don’t want the dark blue side to bleed if the pack were to ever get wet. If necessary, wash your fabric before cutting and sewing. I have two hardware kits in my Supply Shop. One has all of the above hardware, the zipper, and webbing. 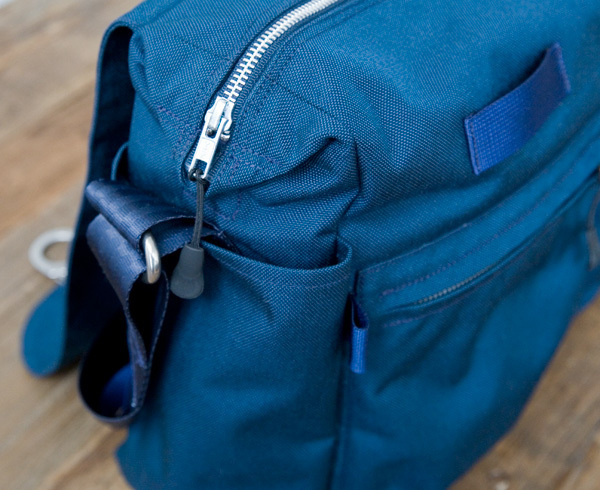 The other option is just the hardware if you want to choose your own zipper and webbing colors. Obviously you don’t have to buy my kit to make the pack, but I thought it would be nice to put everything in one place. You can save a $1.00 on the pattern by purchasing the pattern with a hardware kit. If you would rather use side release buckles or a different type of clasp for the roll top straps, that is perfectly fine. 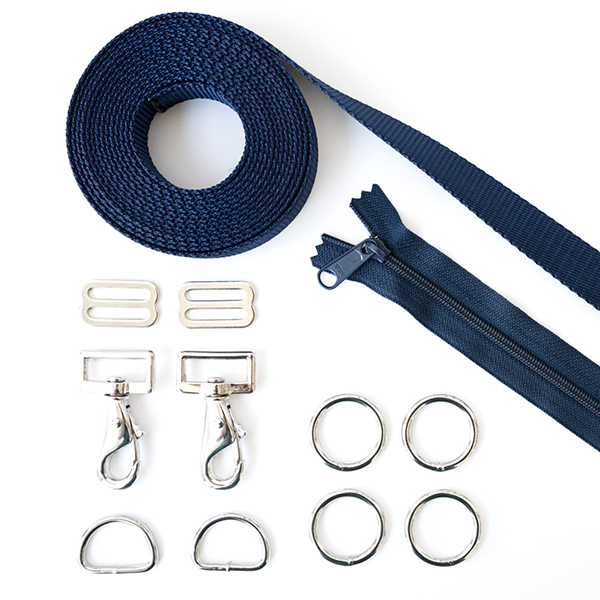 You can also use other types of strap adjusters for the shoulder straps instead of O-Rings. I like the “old school” look and feel of simple metal rings and snap hooks, but that’s just my personal preference. Feel free to use whatever type of hardware you like best. There are lots of places to purchase hardware online. I’ve had good results from Strapworks and Pacific Trimming. 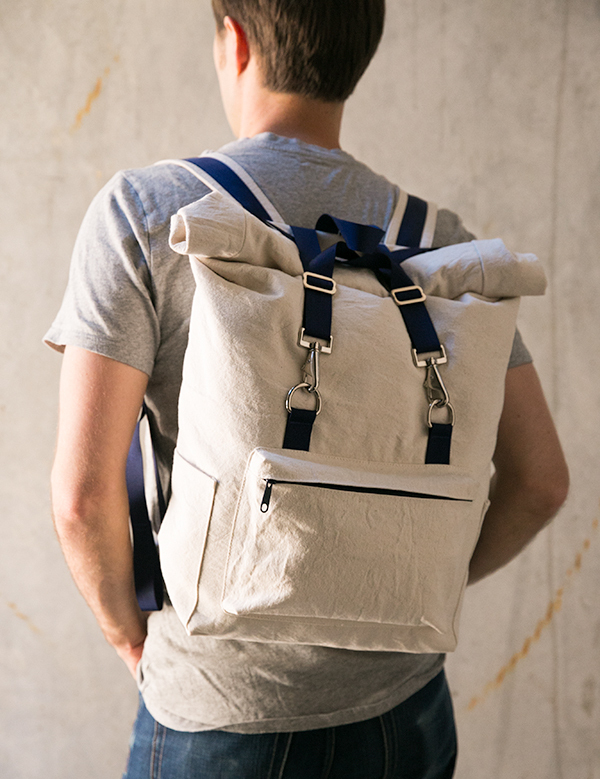 You don’t need any special tools for this backpack other than your sewing machine and a zipper foot. 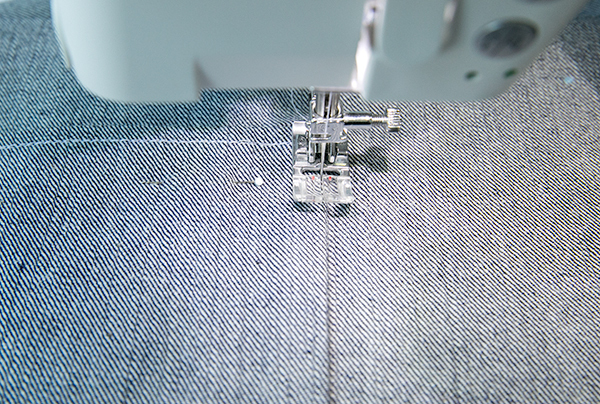 If your machine has the ability to move the needle left and right, then you might not even need the zipper foot. Speaking of needles, make sure you have the appropriate needle size and type for your fabric. I’m using a size 18 denim needle. Here are a few things that I like to have on hand when sewing the Desmond backpack, or anything really. Rulers- great for checking seam allowances and making marks for placement lines. Straight pins- for holding pieces together temporarily. Chalk- my preferred method for marking lines and notches. Always check to see if the chalk will come off of your fabric. Scissors- one for clipping threads, another for trimming seams and/or cutting fabric. Seam ripper. Iron/ironing board. Using a serger is optional. There are some places in the pattern that will need some type of overcast stitch, but a zig-zag stitch on a regular sewing machine will work just fine. Once you have your pattern printed, assembled, and the individual pattern pieces cut out, it’s time to cut fabric. Please note that several of the pieces are used more than once for the exterior of the pack and the lining. 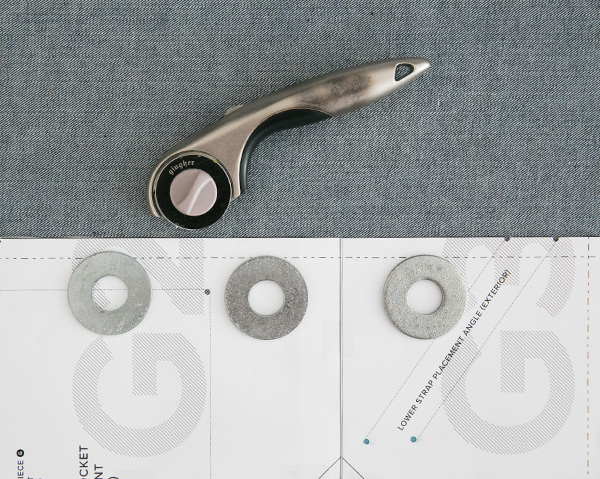 I usually use a rotary cutter with big washers as pattern weights. 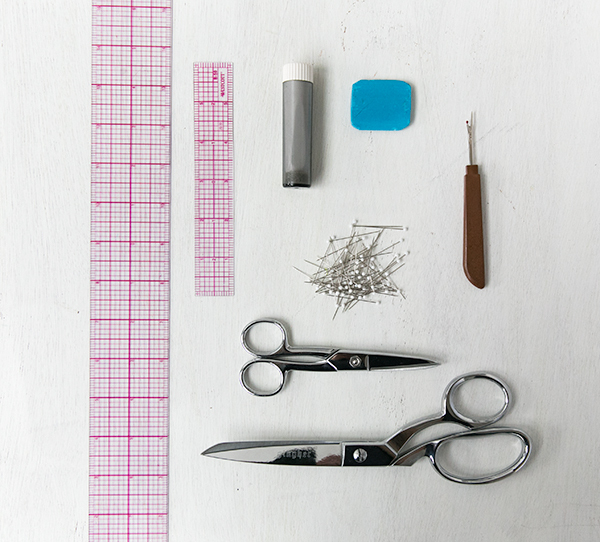 Use whichever method you prefer to cut patterns. I love using a small hole punch for placement lines. If you punch holes on the inside of the lines like I did, make sure to actually draw your lines on the outside of your marks. Using your method of choice, (removable chalk/pencil/ink) transfer all placement markings, notches, stitch and fold lines to the right side of your fabric. 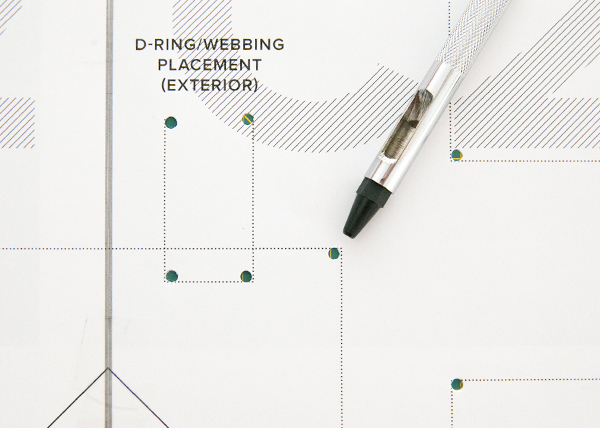 Only mark exterior placement lines on exterior pieces, and lining placement lines on lining pieces. These placement lines are marked exterior or lining on the pattern. Alright, that’s it for this first step! 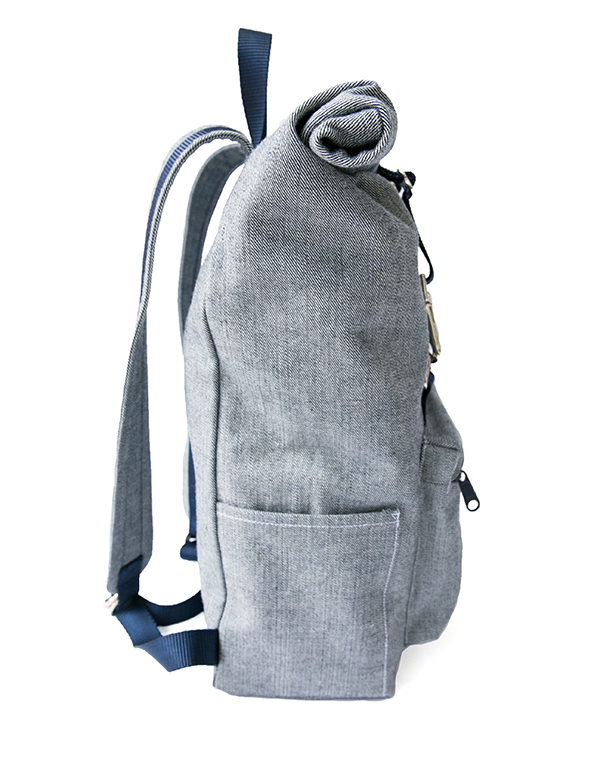 Thursday we start sewing the side pockets on the exterior of the pack. My plan is to post two steps per week for the sew along. For some people that might be too slow, for others that might be too fast. I’m trying to find a happy medium. If you can’t stay on schedule, don’t worry, as these posts will be up indefinitely to assist anyone who makes the pack in the future. If you want to sew ahead, that’s fine too! For anyone who follows me on Instagram, I will be using the hashtag #thedesmondpack for any related posts there. Feel free to tag your pictures as we sew along. 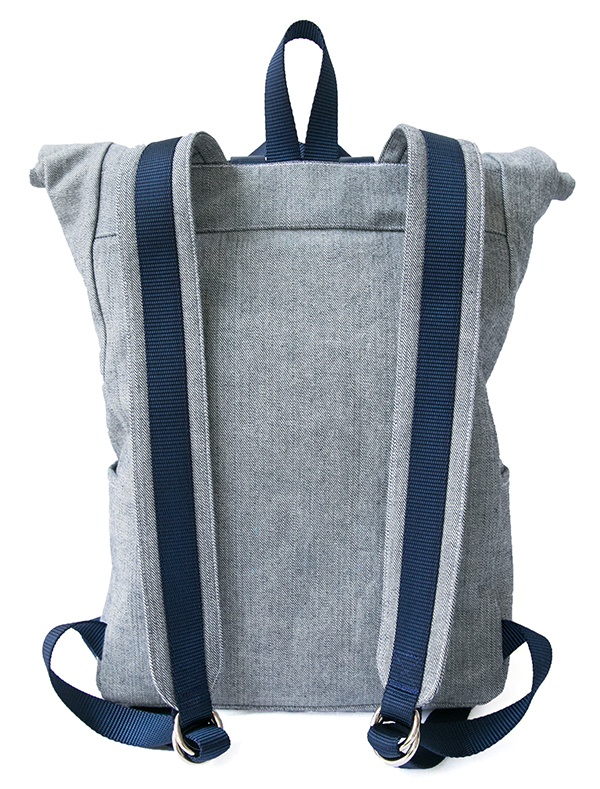 Desmond Roll Top Backpack pattern available in the Supply Shop. *Edit* The call for pattern testers is now closed. Thank you to everyone who submitted the form and expressed an interest to test the pattern. My backpack pattern, the one I announced almost a year ago, is almost finished! I know, it took way too long to get to this point, and even though I have a few good excuses, I won’t bore you with them. 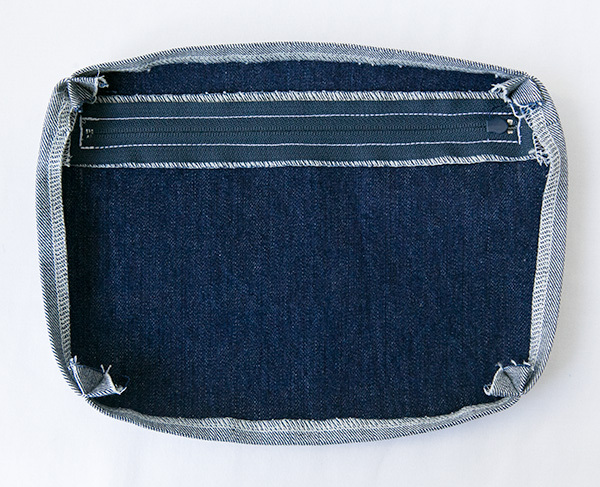 While I’ve completed some initial testing with the pattern, I want to open up testing to some of my readers who are interested in making a roll top backpack. The finished pack is approximately 16.5″ tall, 11.5″ wide, and 5″ deep. It features a front zipper pocket and flat patch-style pockets on the sides. The lining also has several pockets to keep things organized. Keep in mind that this is an unstructured pack, so it’s not necessarily ideal as a long trek through the jungle or technical mountaineering kind of pack, but it’s perfect for an every day tote, weekend get-away, or airplane carry-on. Initially the pattern will be offered as a pdf. download. Once I have your contact information, I will e-mail each tester a pdf. with the pattern and instructions. Please note that the pdf. will need to be printed and pieced together. (1) yard at 60″ wide for the exterior of the pack. (1) yard at 45″ wide for the lining. The form has questions about skill level and how long you’ve been sewing. If you are a beginner, or haven’t been sewing for very long, this is perfectly fine as I’d like a variety of perspectives. 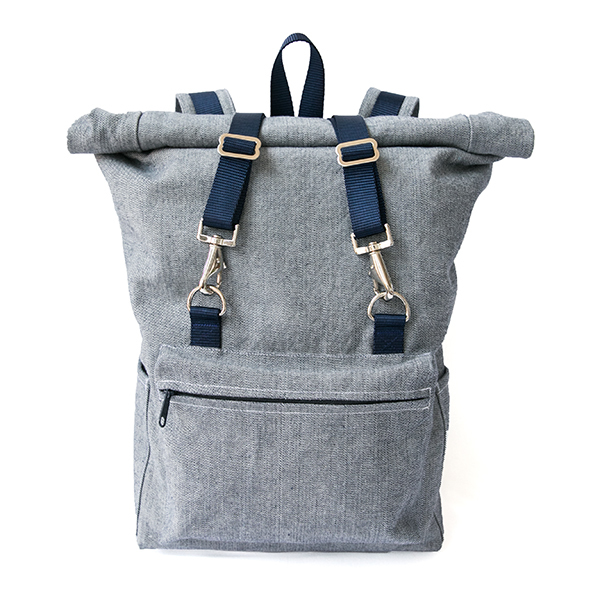 If you have never sewn anything before, this pattern probably isn’t for you, but my hope is that a determined beginner (someone who is familiar with their sewing machine, has completed some basic projects, and knows some common sewing terms) could handle this backpack. I hoping to have the testing phase finished by September 1, two weeks from today. I have learned a lot through this process, but also realize that I have a lot more to learn, and I am open to honest and constructive feedback regarding the pattern and instructions. Taking time from your busy lives to help me test the pattern is something I greatly appreciate. Each tester will receive the final version of the pattern. August isn’t exactly scarf weather in Nashville, but I’ve been “dyeing” to tell you all about this scarf for a while now. Let me backup just a little bit. Earlier this year I was invited to be a part of The Sewing Party! 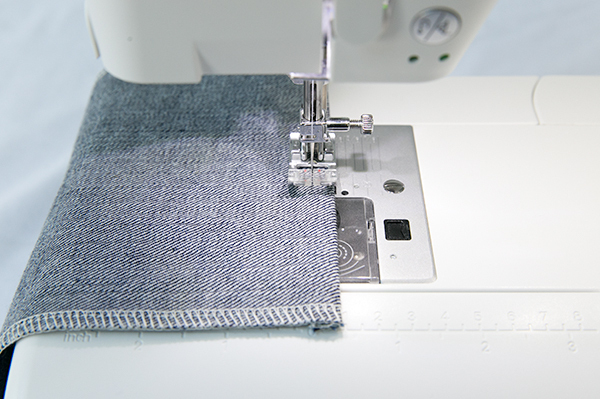 Organized by SVP Worldwide, which is the parent company for Pfaff, Singer, and Huskvarna Viking, The Sewing Party is a collaborative blog that focuses on all things sewing. I’m honored to be part of an amazingly talented group of bloggers and creative people who are contributing sewing tutorials and articles on all kinds of different things from garment making to quilting and everything in between. The other contributors are: Alexia from Green Bee Patterns, Christopher from The Tattooed Quilter, Jennifer from Workroom Social, Jessee from Art School Dropout, Lola from Love, Lola, Marcy from Oonaballoona, Sunni from A Fashionable Stitch, and Devon from Miss Make. I would highly recommend checking out their posts at The Sewing Party as well as their individual blogs and websites. 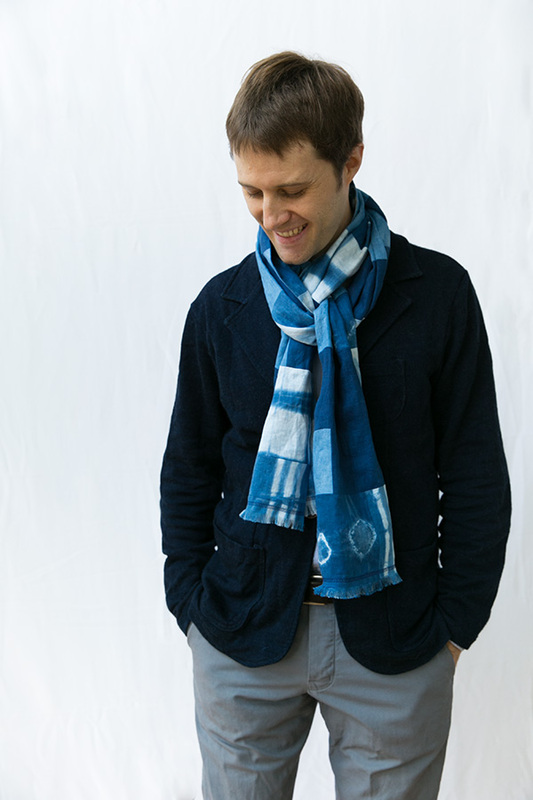 My first post for The Sewing party is a “patchwork” indigo scarf. You can head over to The Sewing Party blog to read about it here. 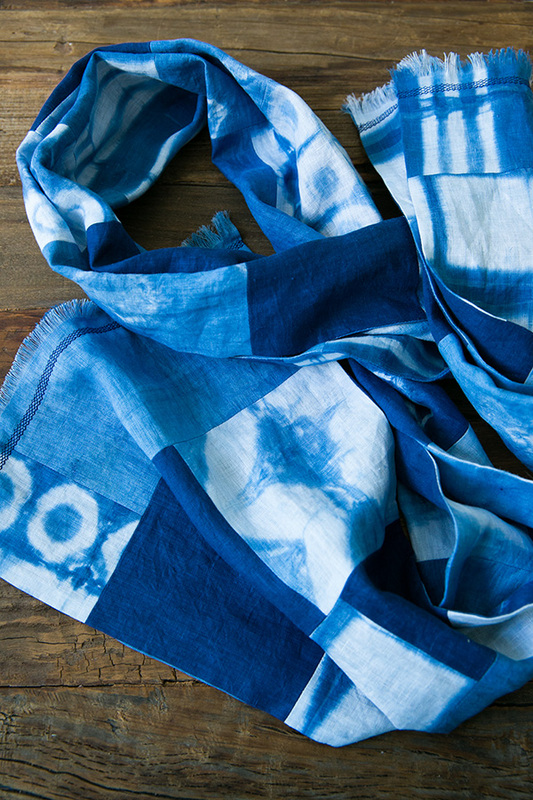 There is a tutorial for how to make your own, as well as a giveaway from Dharma Trading Co. for an awesome indigo dyeing kit and for some fabric to dye. That’s right, I said GIVEAWAY! 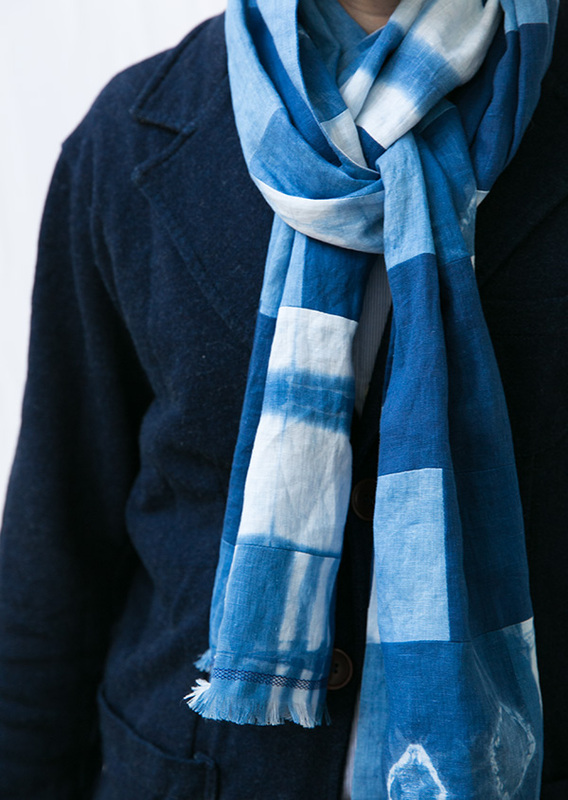 Dharma Trading Co. was nice enough to provide me with the indigo dyeing kit and linen fabric to make this scarf. I hand dyed 12 pieces of linen using various indigo dyeing techniques, chopped it up, and sewed the pieces back together for a “patchwork” effect. There is a full set of instructions and more images of the process over at TSP blog. In exchange for my participation in The Sewing Party, I was provided with a Pfaff Quilt Ambition 2.0, which I used to make this scarf. It is an amazing machine so far, and I’ve really enjoyed some of the features like the IDT system that functions like a built in walking foot. I’m really happy with the way this turned out, and just have to wait until the weather cools down a bit to actually wear it. Come on November! 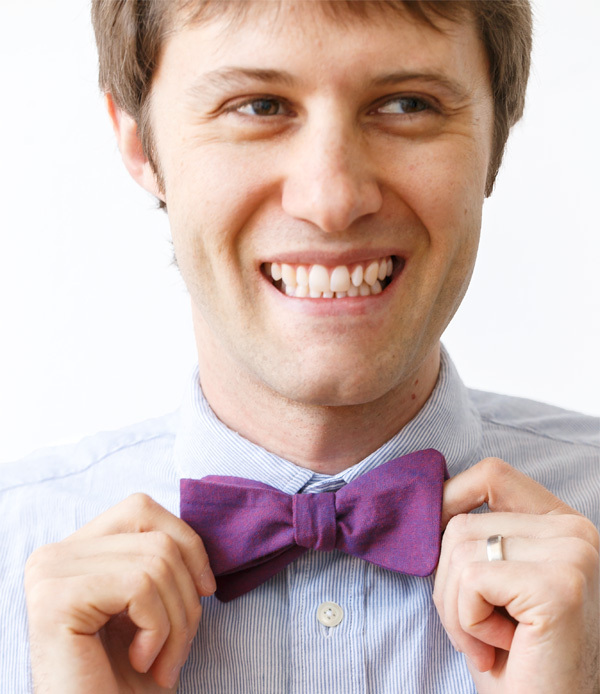 Before I talk about bow ties, you should go check out the Reyna Lay Designs Podcast. Not only is it a great show where Reyna interviews sewers/sewists, indie pattern designers, and other creative people, but she is all about inspiring and empowering people, which is really cool in my book. Oh, and I…um…I happen to be the guest this week! So, if you are into podcasts, and even if you aren’t, go check it out on iTunes or on Reyna’s website. Now, on to bow ties. Earlier this year my wife was invited to go on a cruise to Alaska, and since I’m a nice guy she took me along 🙂 Some people love cruising, others hate it, but put me on a floating hotel en route to some of the most amazing scenery on the planet, and you can guarantee I’ll have a good time. 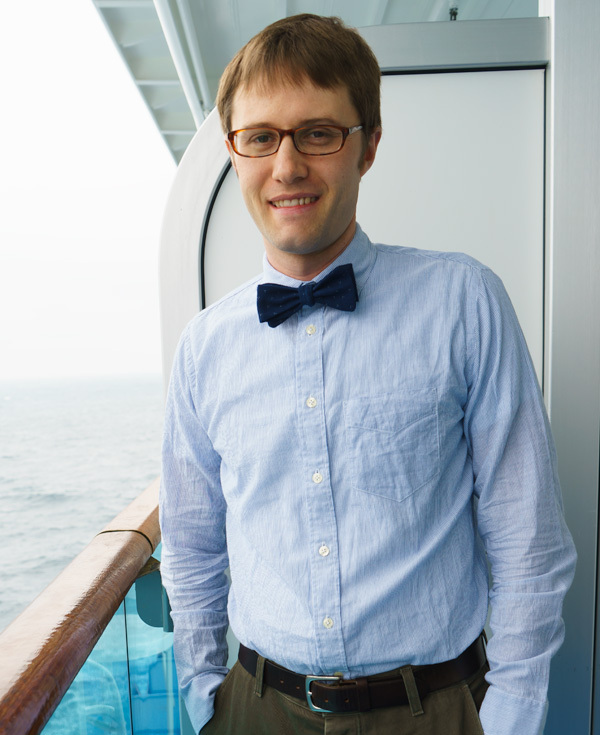 This particular cruise had a couple of formal normal nights, and rather than go all out with a tuxedo rental, I was inspired to make some bow ties for the trip that could easily be worn with my existing wardrobe. 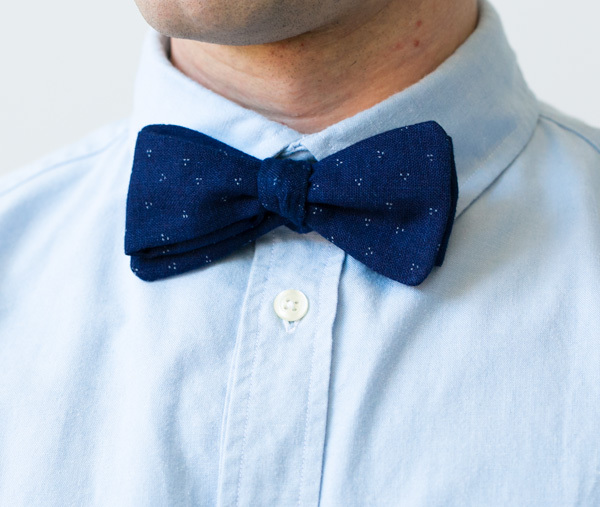 I didn’t used to like bow ties, as they can sometimes feel a little “clown-ish” or “costumey,” and they leave the front of the shirt feeling a bit exposed when worn with a jacket. Recently though, I’ve changed my mind and I’ve actually grown to really like them. I think for me the key is to keep the bow tie understated and somewhat casual. Even though I made them for “formal” night on the ship, the dress ran the spectrum from tuxedos to jeans, and I was happy to fall somewhere in the middle. Sorry about the weird chin shot. As with any sewing project, fabric choice is important depending on the look and feel you want to achieve. For a more casual look, I chose fabrics without any sheen that have some texture. This helped with a softer, relaxed, less stuffy look. I also avoided prints, which could certainly work, but for the sake of versatility I went with mostly solid or very minimal print design. One day I was wandering around and exploring the ship and managed to stumble upon a behind the scenes tour of the main theater. I was so excited to find a sewing machine in the costume department! Nobody else was even remotely interested in the sewing machine, and I got a few strange looks as I checked out the motor and took some pictures. 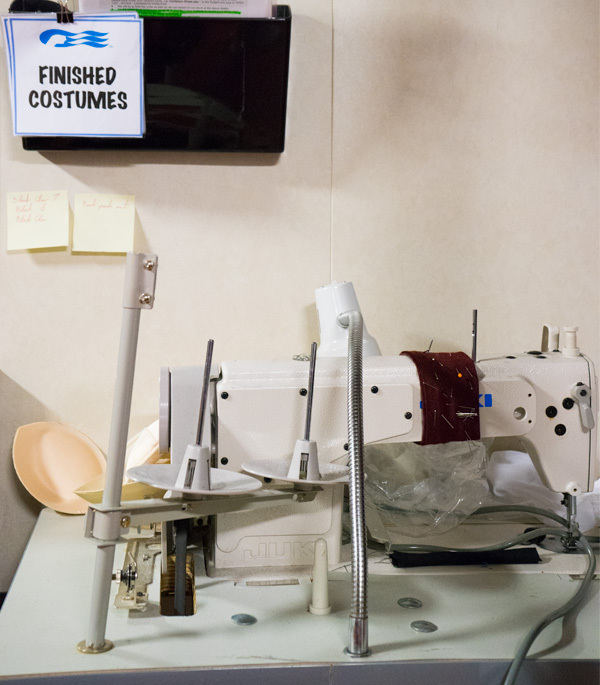 Apparently there are so many different shows that the crew needs to alter costumes right on the ship. A little wrinkled, a little crooked, maybe a little tired, but having a great time anyway. 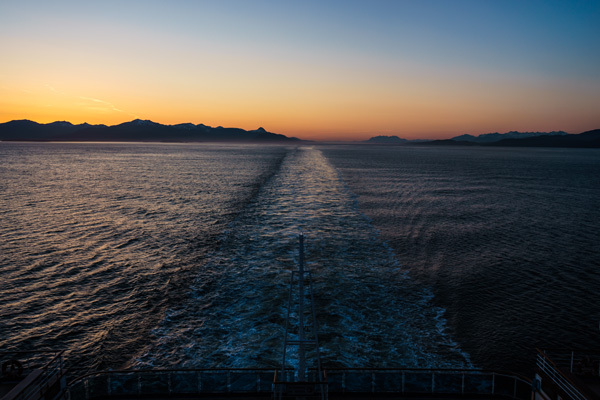 This photo was taken in the Port of Juneau, AK. 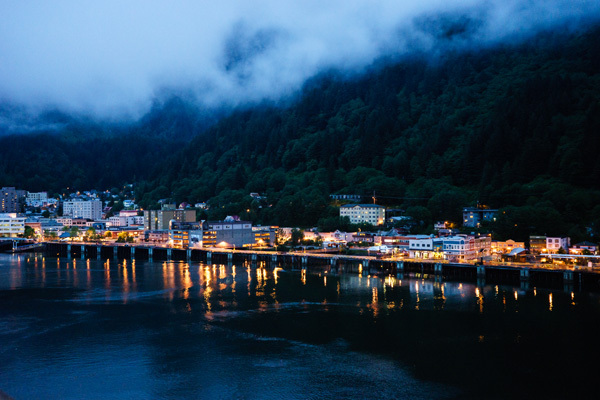 Our cruise stopped in Ketchikan, Juneau, Skagway, and Victoria B.C. We also made our way into the Tracy Arm Fjord. The views, the wildlife, and the port cities were all spectacular. 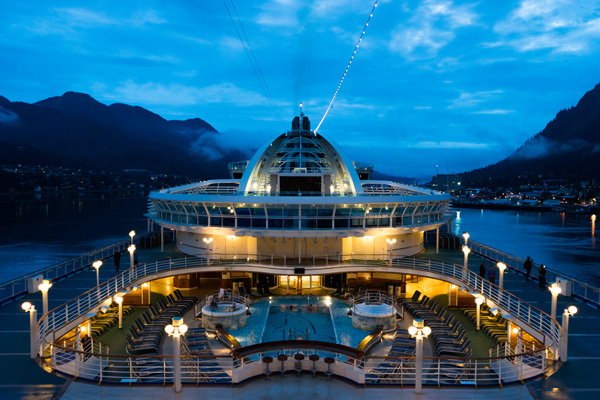 Even if you aren’t all that into cruising, the Alaska cruise experience is really special and something to consider, as most of these ports can only be reached by plane or sea (or some way out of the way driving). More chin. 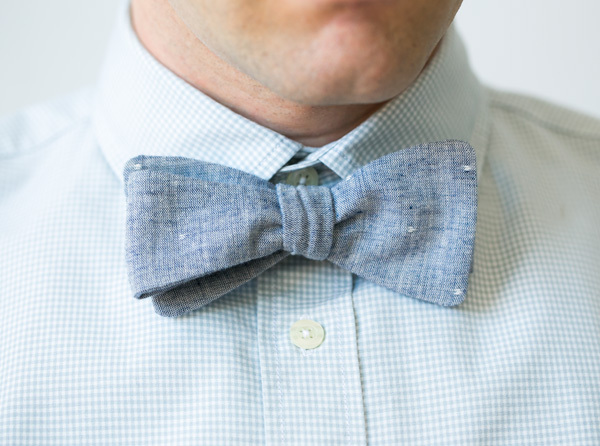 Bow ties are actually really easy to make once you figure out the right size. I’d say that learning to tie one is probably harder than learning to make one, but there’s YouTube and lots of websites to assist with learning the tying part. These bow ties are simply two layers of fabric sewn right sides together with a piece of sew-in interfacing sandwiched in the middle. Turning the tie right side out is an exercise to test your patience, but slow and steady gets the job done. Headed home. Sunset at sea off the back of the ship. Back to work on my jacket and backpack patterns. This last April my wife and I took a trip to Paris and Barcelona, something for which we have been planning and saving for a long time. In preparation for our trip, I wanted to make a bag that was water resistant. 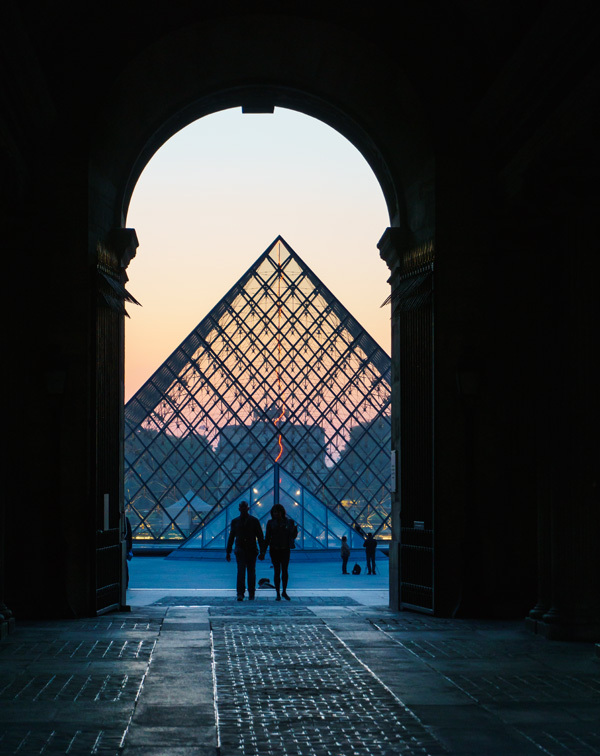 We heard that Paris can be rainy in the Spring, and we needed a way to protect a camera, and a place to stash all of the essentials for long days spent exploring. I also wanted a bag that was made with travel in mind. 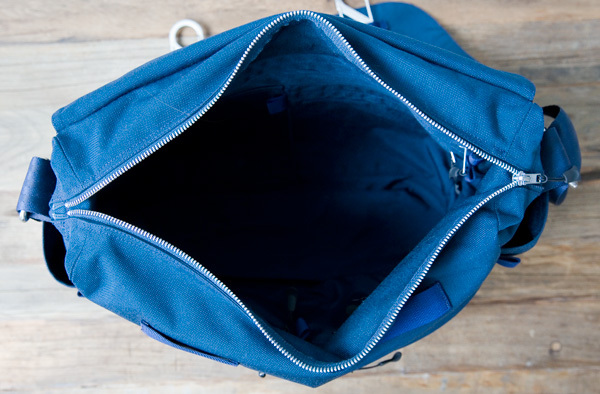 For me that means some outside pockets that are easy to access, and that inside the bag, there are enough pockets and sleeves to keep things organized. For the outer shell and lining, I used 1000 denier Cordura nylon. It has a canvas-like weave on the front, and a urethane coating on the back side that helps keep water out. This stuff is extremely durable and is resistant to tearing and abrasion. 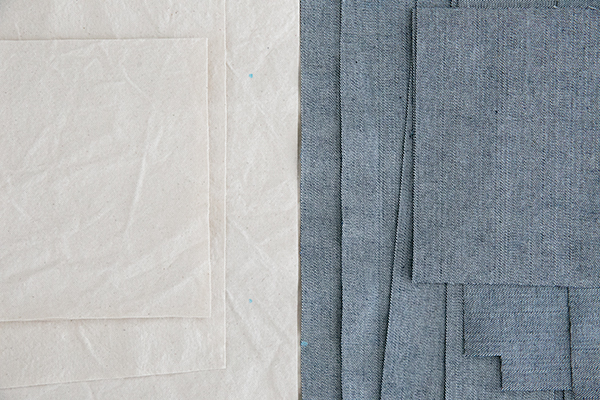 Various versions and weights of this fabric have been used for outdoor and military gear for years. This is the first time I’ve used all synthetic materials. Normally I’m all about natural fibers (and still am), but I wanted to try something new. Plus, the fabric was a nice birthday gift from my mom, so why not! 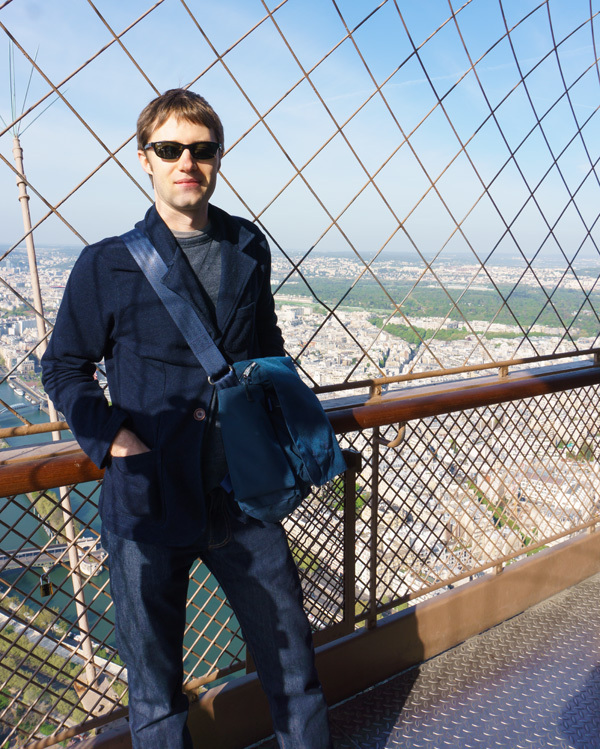 The new bag made it to the top of the Eiffel Tower! We were actually the very first people to the top of the tower that morning and had the whole upper level to ourselves for a little while. I was lucky to snag a couple of tickets in advance that had a time slot on them, which allowed us to skip the lines. I highly recommend this way of visiting the tower. You have to commit to a time slot 90 days in advance, and be willing to stay up really late or get up really early if you don’t live near Paris, as the tickets are limited and go on sale at 8:00 am Paris time. But it was well worth getting to skip the two-hour plus lines that quickly formed. 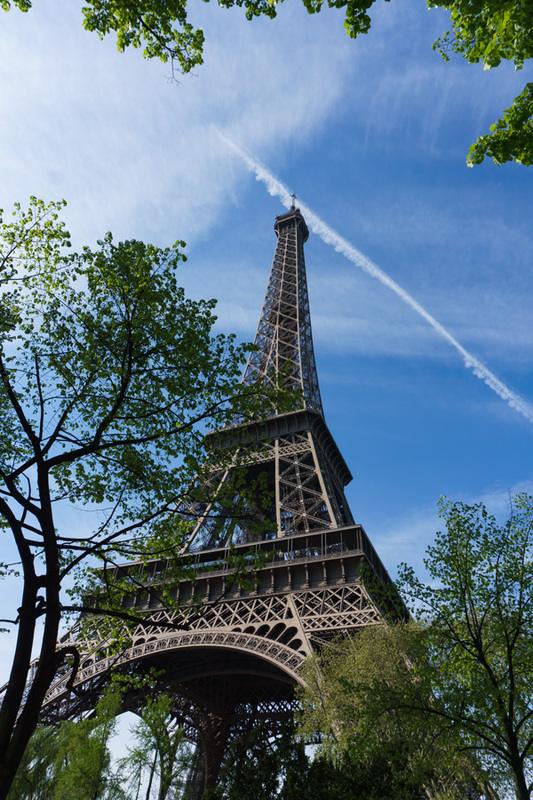 Buy them directly from the Eiffel Tower website and not a tour company that charges a premium. 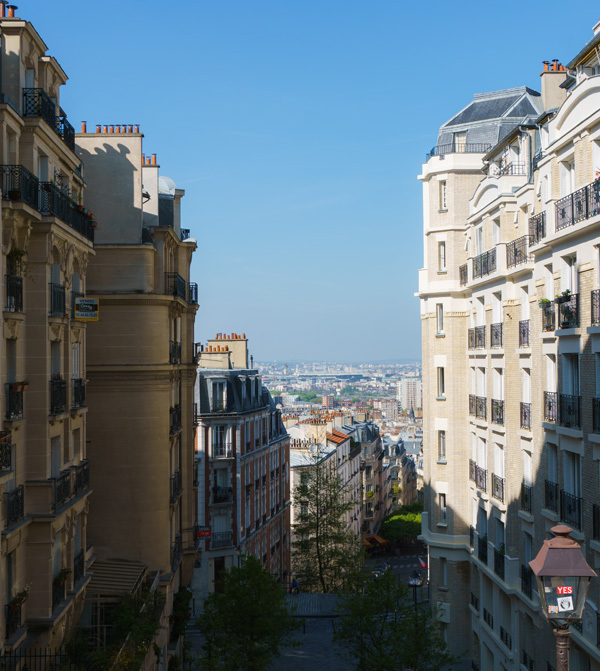 This was the street we stayed on in Paris, and it was pretty much everything I imagined it would be. Narrow, with lots of shops and interesting places to eat. Me, awkwardly posing against a wall outside an amazing place that served chocolat chaud. This wasn’t like any hot chocolate I’ve ever had. It was really thick and tasted like a melted chocolate bar. The whipped cream was so thick it was practically butter. By the way, if it looks like I was wearing the same thing in every picture, I pretty much was. We were gone 13 days and I like to pack light. That means one pair of jeans. These jeans. 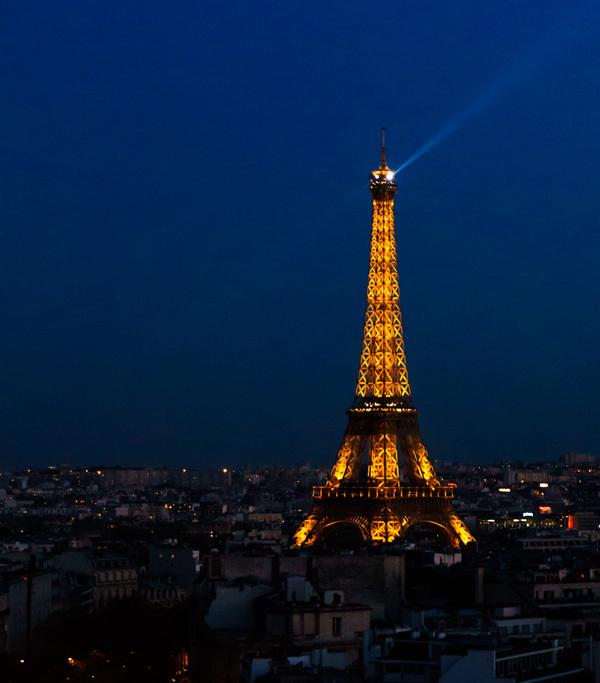 Paris, the city of love and lights. Between a “real camera” and my iPhone, I think I have a gazillion photos of the Eiffel Tower. Day time, night time, it begs to be photographed. Back to the bag. Even though there is an over-the-top closure like a traditional messenger bag, I also wanted a zipper top to keep things from sliding out, and for a little extra security. Since the top of the bag is built in as extra height added to the side panels and end pieces, I needed a way to hold down the triangle flaps created by forming the “gusseted” top. On each end of the bag where the main zipper stops, I sewed in some really strong magnets to hold these flaps down. I could have stitched the flaps down, but wanted the option of lifting them up to make packing easier. The magnets I used are actually too strong, and were very difficult to sew. They stuck to the bed of my machine and the feed dogs would not advance the fabric. I would probably change this aspect of the design for future bags. Quite often people form the gusset and sew these triangle flaps with the bag inside out. As a result, the flaps are hidden on the inside. Leaving them on the outside, however, allowed me to make the zipper two to three inches longer. 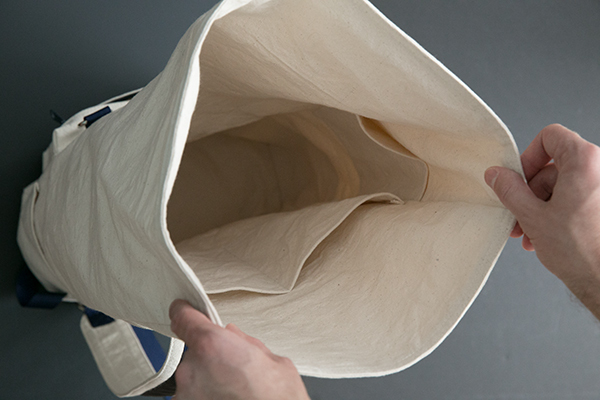 This creates a bigger opening facilitating packing and finding objects inside the bag. 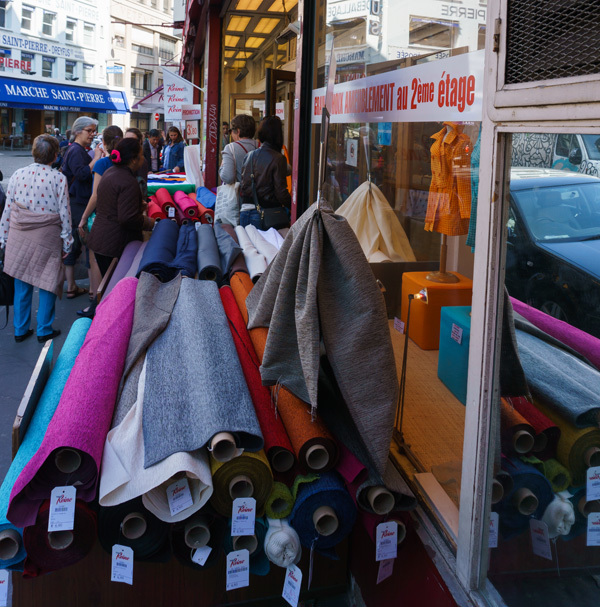 No visit to Paris would be complete without a trip to the fabric shops in Montmartre. There were quite a few shops clustered in this area with lots of fun fabrics. I wish I had had extra space in my suitcase to bring some home. Thanks to Milène at Micoton for all of her great fabric and site seeing suggestions in Paris. 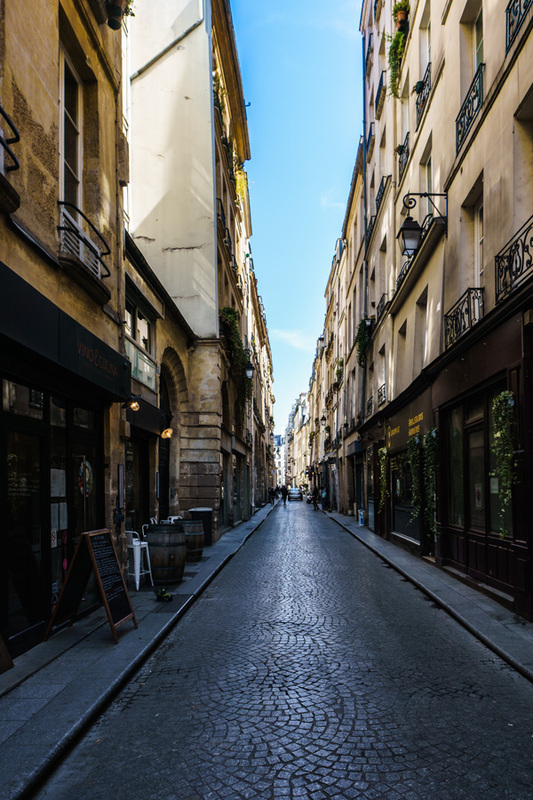 There were seemingly an infinite number of streets, alleys, hills, shops, and cafes to explore. More than enough for a lifetime of visits. I truly can’t wait to go back. 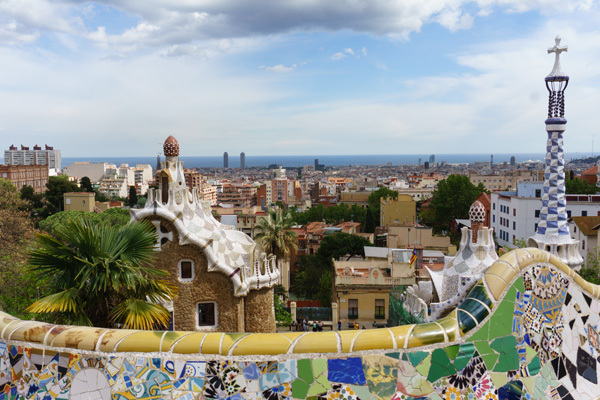 After five days in Paris, we packed our bags and caught the high speed train to Barcelona. 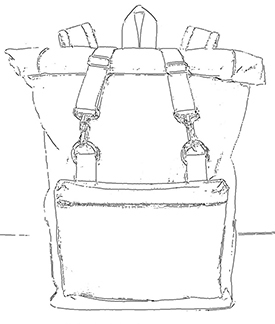 While the bag is primarily meant to be worn as a shoulder bag, because we were frequently climbing up in to trains and down into metro stations, and often had to carry our suitcases as well, I wanted the option to wear the bag like a backpack so it wouldn’t flop around if my hands were full. The back panel is made with a 1/4″ layer of closed cell foam sandwiched between the lining and exterior for structure and comfort. I also made two shoulder straps and sewed some extra webbing loops on the back/bottom corners of the bag. 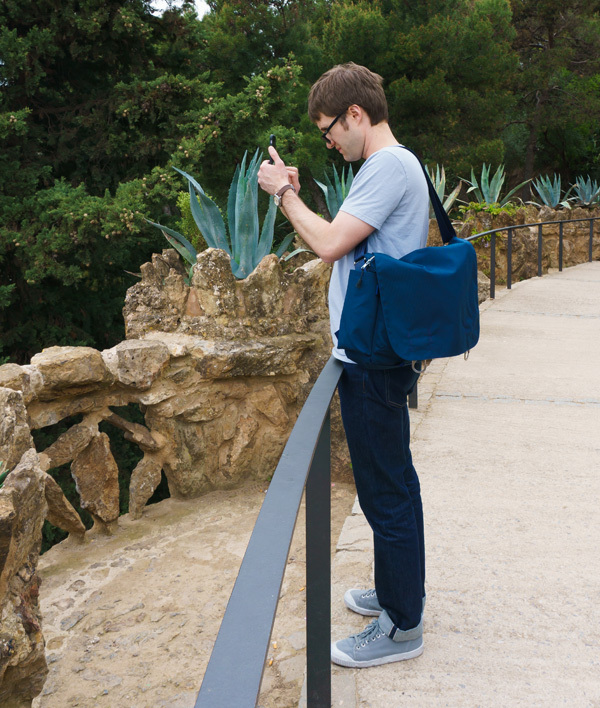 I can quickly attach a second strap with carabiners and wear it as a back pack if I want to. On to Barcelona. 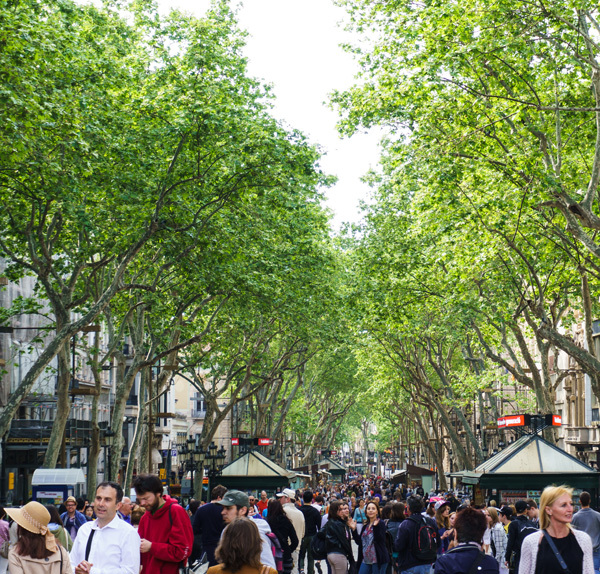 This is the famous La Rambla street, which was always packed with people. 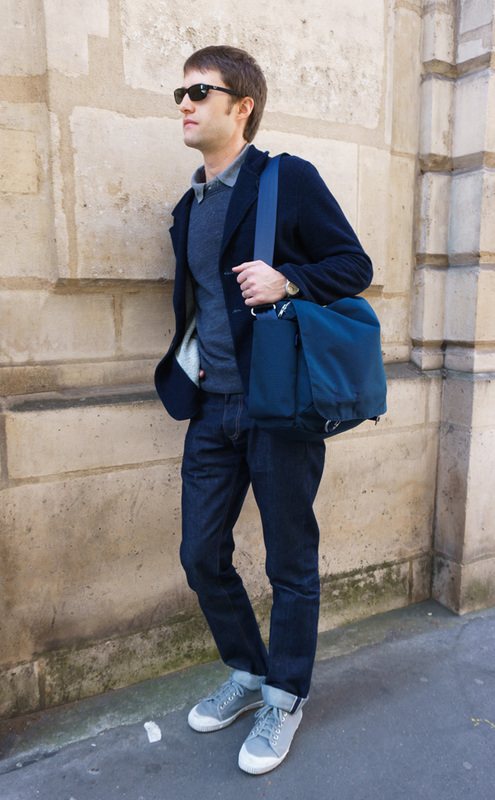 I was happy for my zipper top bag as this street is well known for its pickpockets. Luckily we had no issues at all in terms of safety or security. Both cities, Paris and Barcelona seem very safe, even at night. I used seat belt webbing for the shoulder strap, which was new to me. It was actually very easy to work with, and is quite comfortable to wear. This photo was taken outside the Montjuic Castle in Barcelona, which overlooked a huge port and shipping area. 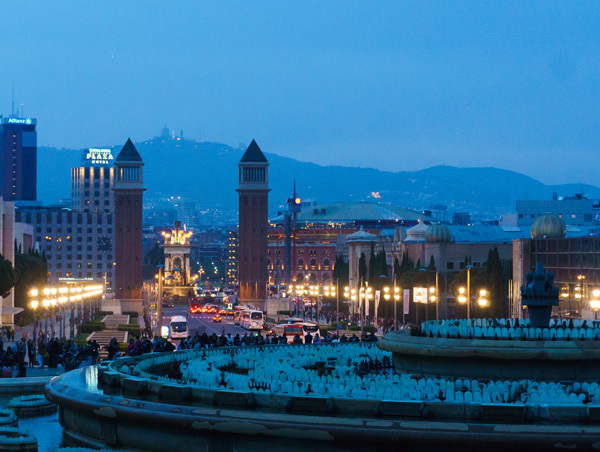 The Magic Fountain of Montjuic. This fountain lights up and does a lights, music, water show in the evenings. It was pretty spectacular, but I also like this view of the city with the fountains off. 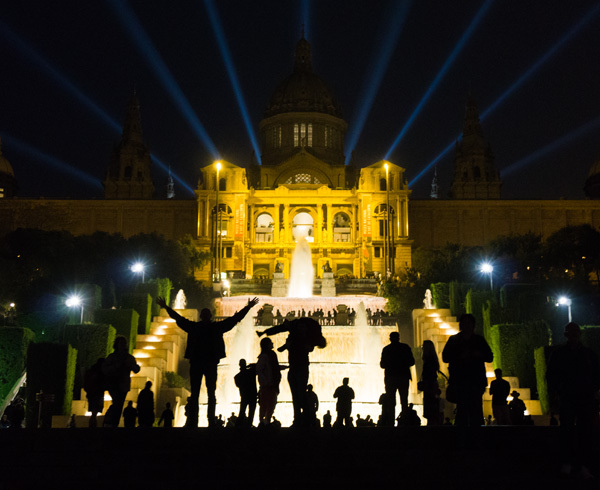 Directly behind the fountain show was this building, The National Art Museum of Catalonia. It also lights up during the fountain show. I love the guy with his arms raised to the sky, and the silhouettes of all the people gathered on the steps. 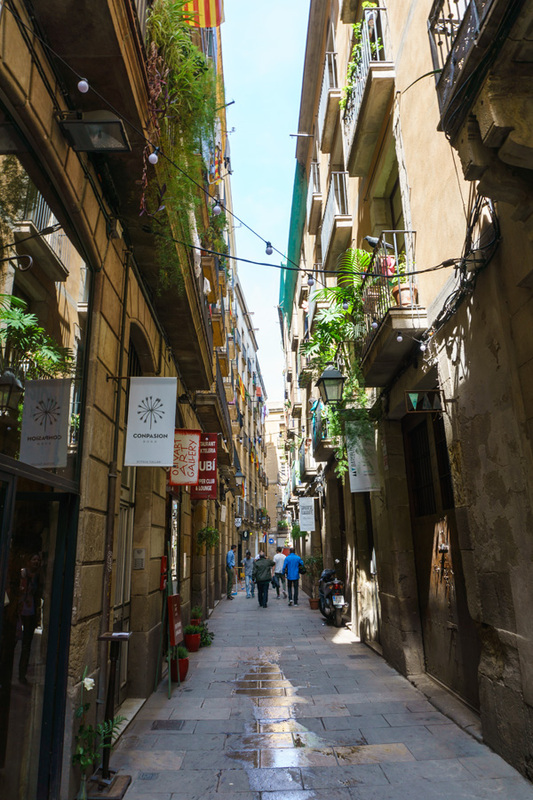 Similar to Paris, the old part of Barcelona was full of shops and tiny narrow streets to explore. 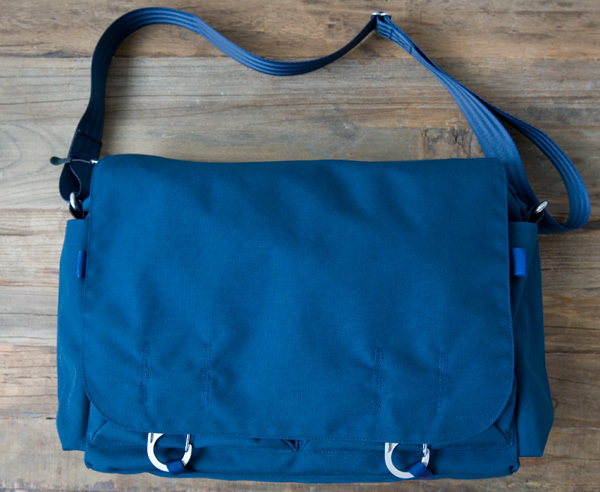 The inside of the bag has four zipper pockets in varying sizes. One that fits 8 1/2″ x 11″ sheets of paper or a magazine, one that fits passports, and two others for a first aid kit, snacks, and flashlight. 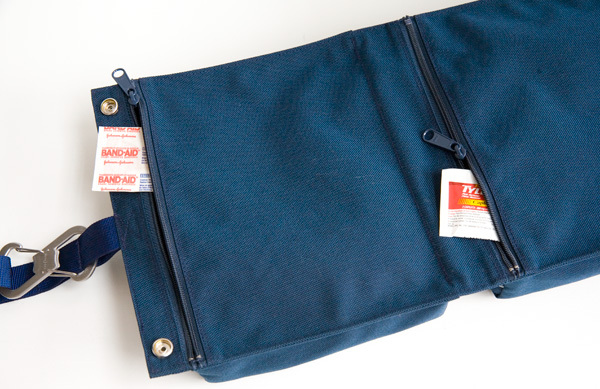 The open pockets on the ends are designed to hold a water bottle or umbrella. One thing I learned with this project is to try and use a light colored fabric for linings in the future. In low light, finding small things down in the corners of the bag can be a little difficult since I am basically staring down into a black hole. Maybe a lighter colored lining would help with this. Some of the architecture in Barcelona is indescribable. 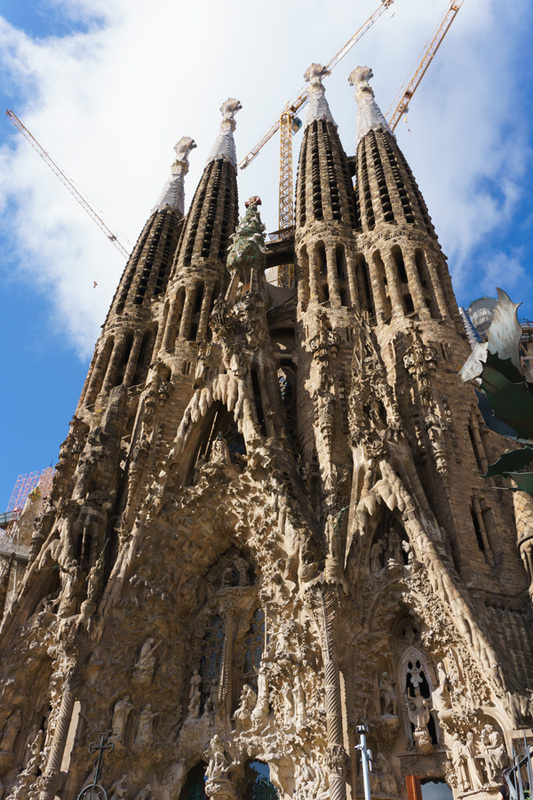 Gaudi’s famous masterpiece, the Sagrada Familia. It is unlike any basilica I’ve ever seen. Construction began in 1882 and is still going strong. It won’t be finished until 2026. 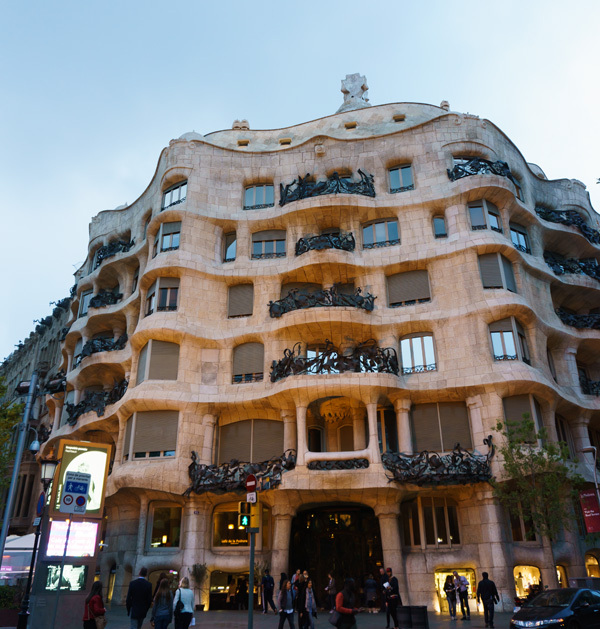 Gaudi’s Casa Mila, or La Pedrera. Overall, I am happy with the way this shoulder bag turned out. It was the perfect companion (other than my wife of course!) for running around the streets of Paris and Barcelona for two weeks. We were in and out of planes, trains, and a few automobiles, and I was really able to test the design out. There aren’t too many things I would change. The dimensions are a little on the big side, but I looked at the size as sort of a compromise. It might be a little big as an ideal day bag, but the extra size allowed me to get away with only having a small carry-on size suitcase for the whole two weeks away from home. So in that sense, it had two purposes – just small enough that it can be carried around all day, but big enough to pack things that didn’t fit in my suitcase. Gaudi’s Park Guell. If I could travel for a living, I would. Can’t wait to get out on the next adventure! Since a few people have asked about the status of my backpack pattern, I thought I would give a quick update. The process of getting the pattern ready and formatted is taking far longer than I expected. If I had known this from the beginning, I would have waited to make the announcement that I was releasing it. The good news is that I am making progress. The pattern itself and the instructions are finished, I am simply waiting on graphics and illustrations. Since I’m not a graphic artist or illustrator, I have to wait my turn to have these services completed. I greatly appreciate the continued interest in the pattern. Trust me, I want to get it out as soon as I possibly can. Once I have an official release date, I will be posting about it. My goal is to offer a pdf. version (hopefully in more than one format so it can be printed at home or on a large format printer), and I also hope to offer a physical paper version as well. For over a year, my wife and I have been planning and saving for a trip to Europe, specifically Paris and Barcelona. We happen to be leaving this week, and I couldn’t be more excited! Due to the threat of a French air traffic controller strike (which they have now called off), we are also getting to see a little bit of London on a long layover before taking the train to France. One of the things I needed for this trip and any travel in general is some kind of bag to hold all of my toiletries (toothpaste, contact solution, shampoo, etc.). Previously I carried everything in gallon sized plastic bags, which was less than ideal. The plastic bags would tear, sometimes they wouldn’t close, and they made organizing impossible. Since I had some extra Cordura fabric and a free Saturday, I drew up a plan, made a quick pattern, and put this thing together. It was actually a little more complicated than that, but I’m happy with the result. The pockets are sized so that I can easily pull out my quart sized bag of liquids when going through security at an airport. 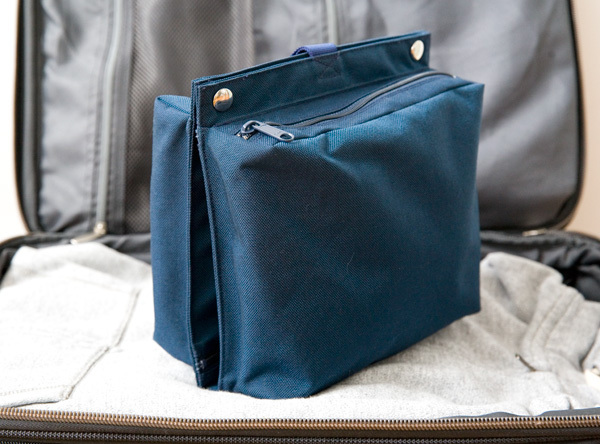 Depending on my packing situation, the dopp kit can fold in half and snap shut, or it can unsnap and lay flat. Lots of toiletry type bags are big chunky brick-like bags. These are fine if you have a large suitcase, but trying to pack in a way that leaves a large enough place for that shape of bag can be challenging. 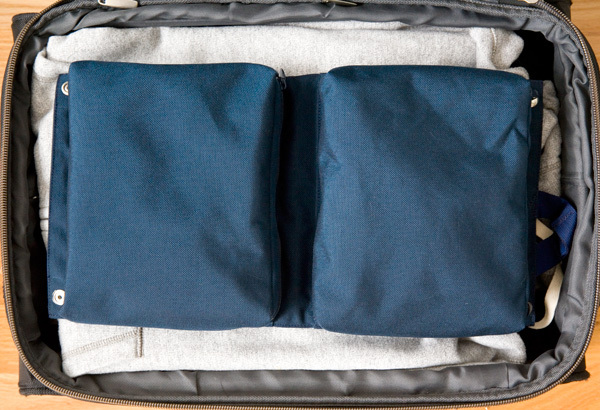 This kit can lay across a suitcase if necessary to make packing easier. The back side has shallow sleeve pockets to hold flat things like bandages. 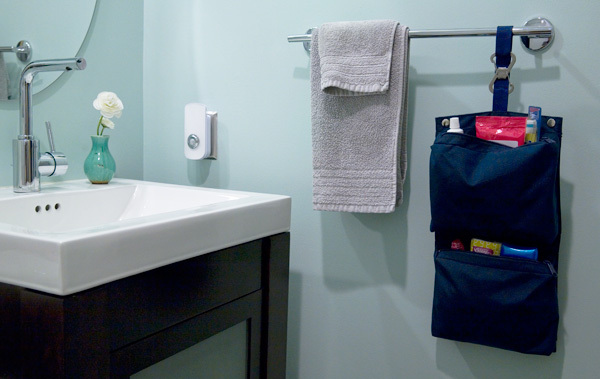 Oh, and that nifty clip you see on the left side of the picture not only allows the kit to hang from a towel bar or loop around another object, but it also doubles as bottle opener! You know, for hotel beer. The company that makes that clip makes some other cool hardware that I have used on another bag (post to follow when I get home from my trip). As I mentioned above, I used 1000 denier Cordura nylon fabric, which is easy to clean and dries out quickly if it gets wet. I’m looking forward to testing this dopp kit out on the road!